Turn your Professional LinkedIn Profile into an IMPRESSIVE statement of who you are! Understanding your background, objectives, and ideal client, we craft your unique professional story in a manner that engages ideal audiences seeking your product and compels them to reach out to you. Utilizing a conversational, enticing narrative approach, your updated professional LinkedIn profile will provoke confidence and credibility while optimally showcasing you. Are you managing your professional reputation? If you do a Google search on your name chances are your LinkedIn profile will come up first, reason enough to be confident that you have a stellar profile that is up to date, optimized and showcases your professional brand. Google has been sending more traffic to Google in the past six months of 2015 compared to the same period in 2014 and this trend is expected to continue into 2016 according to a recent news report. Remember, people, meet us online often before they meet us in person. You need to make an important first impression. An incomplete profile can communicate indifference – and what professional wants that! A professional LinkedIn profile communicates what and who we are all about and affords us a great opportunity to tell our story far beyond how we might show up on a resume. We can share through multi-media platforms which enhances who we are – video, slide shares and images further develop our brand visually attracting the right connections. Remember, people meet us online often before they meet us in person. You need to make an important first impression. • Think about yourself as a brand. • What is your personal brand? • How can you build an emotional connection to others? • Build a brand that is reflective of who you are in the real world not who you are on a resume. Updating your professional LinkedIn profile is just the beginning. We also show you the best ways to leverage your LinkedIn profile and LinkedIn for networking success. To be found on LinkedIn requires a keenly optimized profile as well as compelling content whereby someone would want to learn more about you. We have just seconds to grab someone’s attention and make that all important first impression. The time is NOW to evaluate your current online reputation and determine what you want to be known for. Gain a keenly optimized LinkedIn profile. Win in business with the benefits of professional LinkedIn profile updates. Turn your Professional LinkedIn Profile into an IMPRESSIVE statement of who you are. 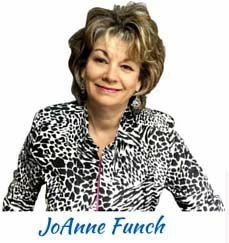 JoAnne Funch, owner of LinkedIn for Business: knows how to help individuals build their professional business LinkedIn profile and how to optimize business profiles on LinkedIn.